Creating a blog on your website is just as easy as adding text or visuals. 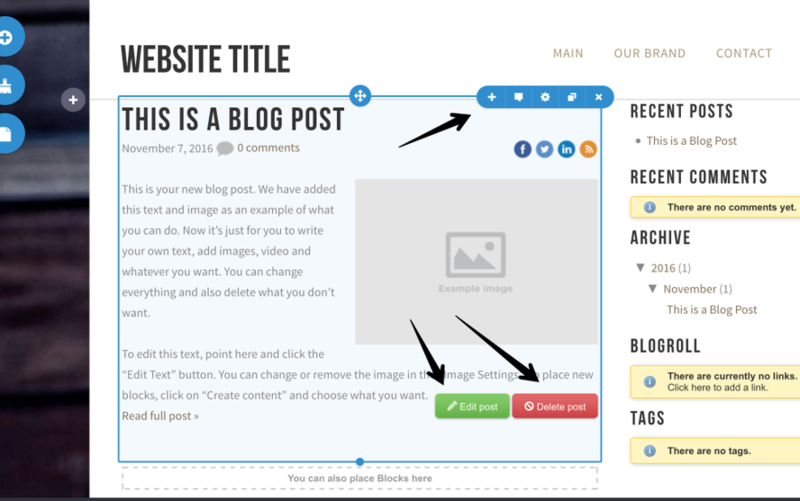 Simply drag and drop a blog block to your website and start creating your content! Blog entries are managed just like any other page on the site: you can add images, video, sound and more to make your posts just the way you want them to be. Would you like to see what a blog can look like? 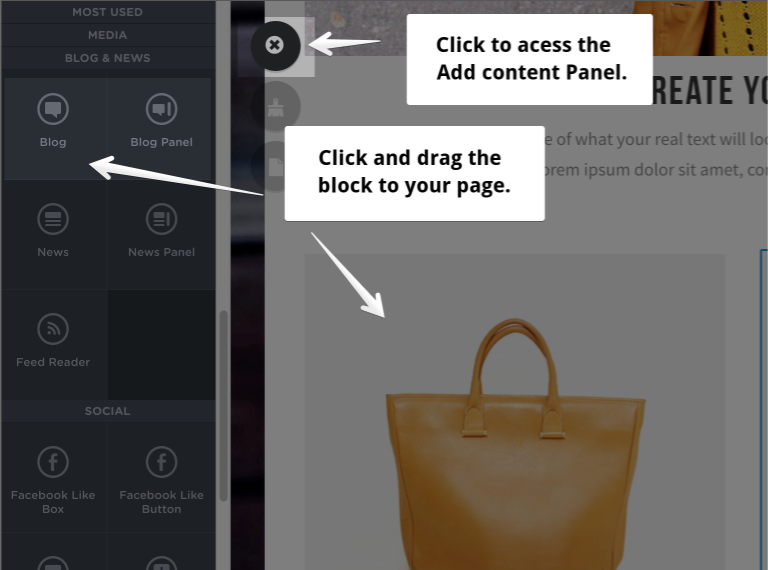 In the Add Content panel, click and drag the Blog block to your website canvas. Place the blog where you would like to display it - perhaps on its very own blog page. If you would like to, you can add a Blog Panel next to your blog block, where your archive, comments, links and more will be seen. 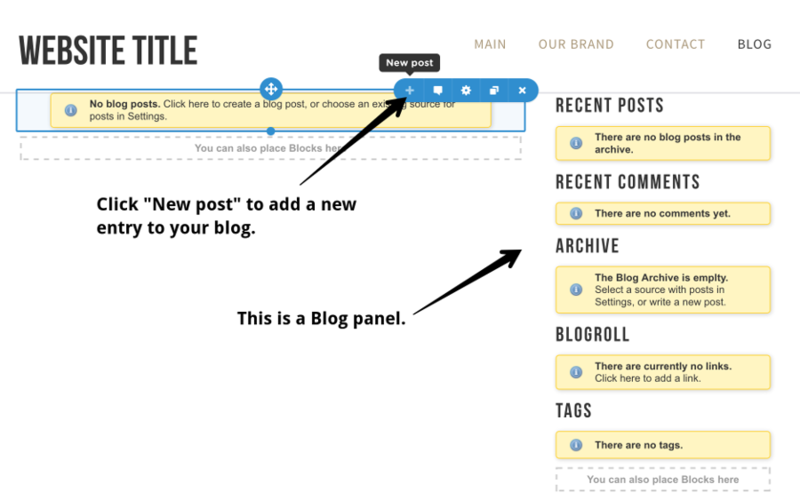 Tip: if you want to add a Blog panel next to your blog, choose a two column layout. 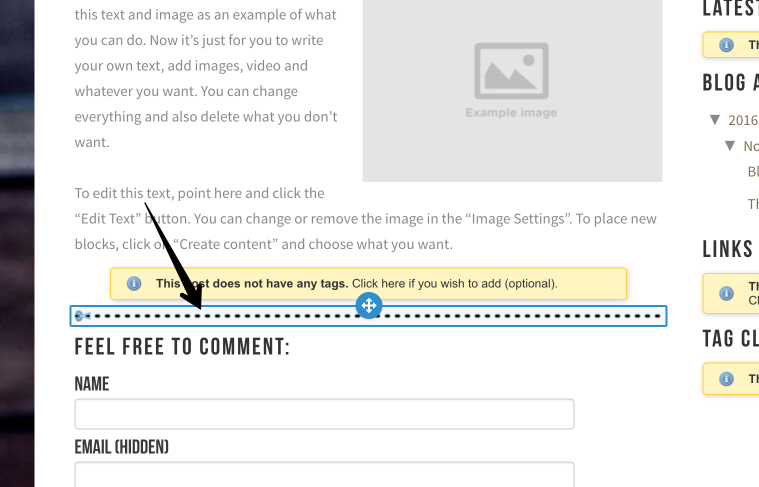 Place your cursor over the blog element and click Settings to see more options for your blog. Once you have a blog, it's time to get creative. 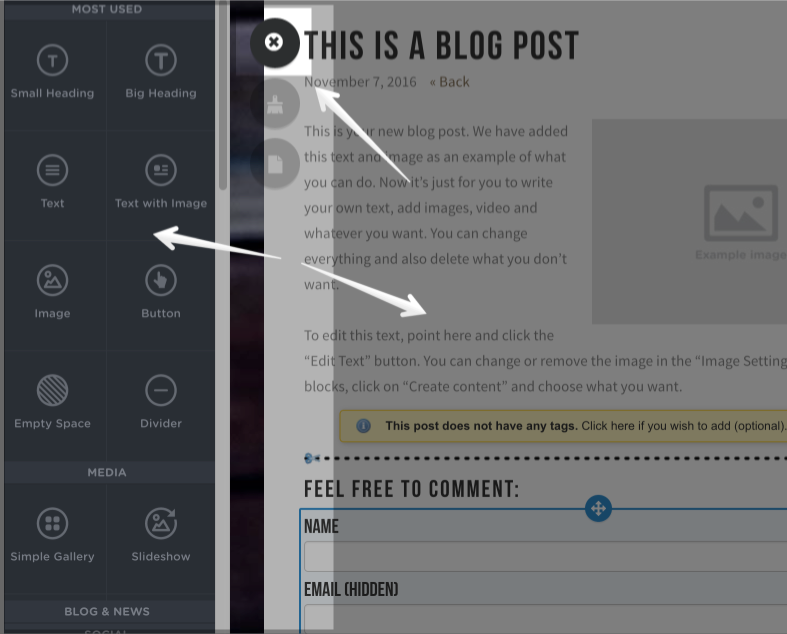 To start writing a post, simply mouse over the blog element and click New post. 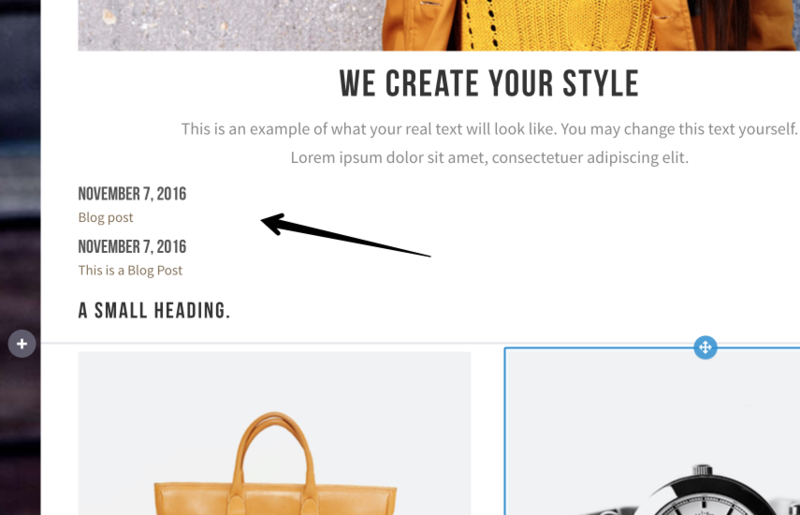 When you add a new post to your blog, a new sample page will appear. This page can be edited in the same way as you edit other content on your site. Mouse over the frame of the header or the text to change its content, or to access settings. When you edit your blog post, you can use all the elements from the Add Content tab. Drag the blocks you wish to use, such as an image gallery, and drop it in the blog post you're working on. Here it is: your first blog entry. 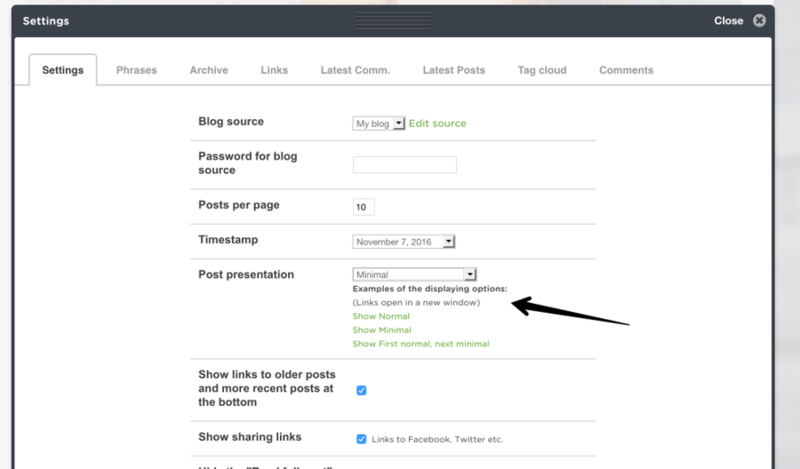 Mouse over it to show the panel, where you can add a new post, edit the current one or access the blog settings. You can have several different blogs on your website. 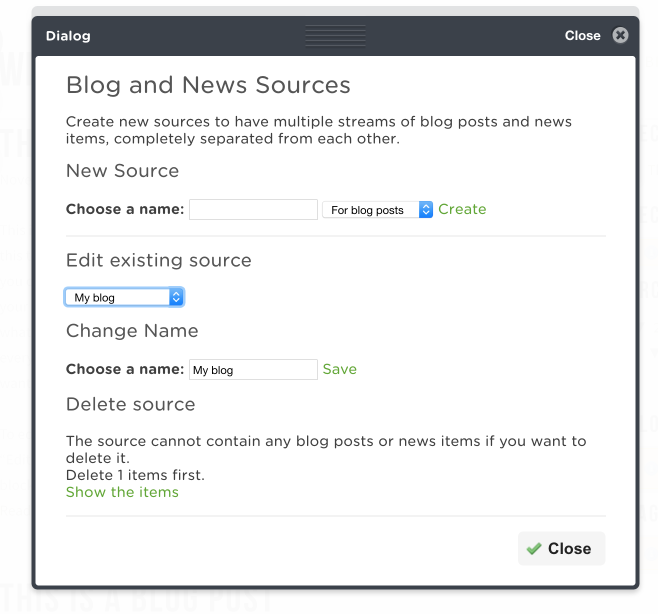 To manage which content goes where, you can organize your blogs into different sources. Click Edit sources to add new sources, and use the drop-down menu to use a specific source for a blog. You can click Edit sources to see this dialog box, or click Settings in the blog you're working in. The same blog source can be displayed in different blogs. For example, you might want to have a small blog on your start page, and a larger one on a specific blog page. 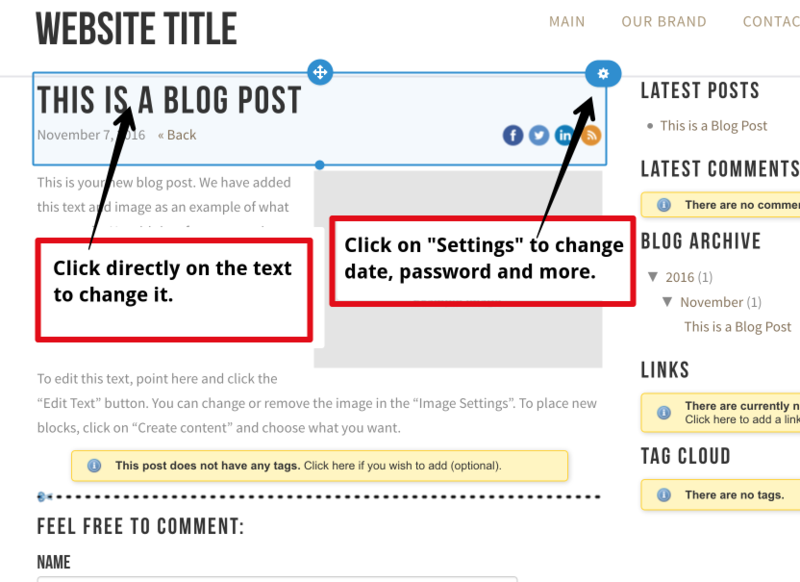 Choose between different ways to display your blog in the blog Settings. When you're working in a blog post, you can choose how much of the post to display on the page by using the Preview limit. Adjust the dotted line to where you the preview to end. Anything under the dotted line will appear when a blog post is clicked. My blog posts show up in double, what have I done wrong? Don't worry - you have added two blog blocks to the same page. If they are set to the same blog source, your posts will show up in double. Do this: Delete one of the blocks by placing your cursor over it and clicking Delete, then add a new post.